Hosting a successful rehearsal dinner requires thoughtful planning and effort. Traditionally, the parents of the bride pay for the wedding while the parents of the groom take care of the rehearsal. However, these days it’s a who’s who field day and anything goes. Marriages are no longer as black and white as they used to be. Wedding ceremonies have become traditional while rehearsal dinners and cocktail hours have turned into full blown events. No matter who is hosting, a rehearsal dinner should be fun and stress free. Rehearsal dinners are a time for family and friends on both sides of the union to meet and get to know one another. After all you’re just one day away from officially becoming family so why not get the ball rolling early? Also, if you’re the groom it won’t hurt to make one last effort at proving to your future father-in-law that you are the right man for the job of marrying his daughter. Hosting a good rehearsal dinner starts with the people. It’s not about the numbers as much as the quality of people you choose to fill the room with. At the very least these people should be your family, members of the wedding party, and any significant others of your guests. Don’t hesitate to invite old college friends who may be traveling a long way or colleagues you’re close with from work. Make sure to send out formal invitations to your dinner guests so you have a proper headcount. There’s no need to stress about who might come. The only people that matter are the ones who you know are coming. Next, choose a venue that will best hold all of your guests. For smaller, more intimate rehearsals I recommend the private room of a nice restaurant. For larger parties, a sit-down dinner at a hotel ballroom will work very well. If you’re getting married in a church, many churches have the type of space outside of the chapel to cater a nice dinner and host your guests. Other venues to consider include beer gardens, rooftops, or even a bowling alley. All in all, try to host the dinner in a space away from where the actual wedding will take place to not take away from main event. 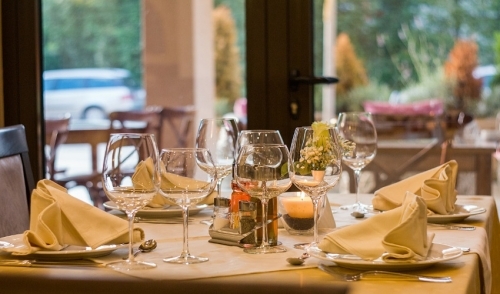 Location of a rehearsal dinner is important, but not at the expense of the big day. As a host, make sure to time the dinner appropriately so guest don’t get too tired or hungry. Plan to start early so that dinner can take place at a reasonable time right after the rehearsal. The final tip for hosting a rehearsal is to not overlook the food. Food can make or break any event and rehearsal dinners are no exception. The food from the restaurant or caterer must be on point leaving your guests satisfied and even more excited about what the wedding will bring. Food is also a great talking point for any table so take note and make sure the conversation flows in a positive direction. Don’t waste time planning the rehearsal dinner. Ease in planning is essential to meeting the goal of hosting a stress free and fun night. Be welcoming, hug everyone, kiss every baby, and don’t be too scared to share the mic with your loved ones whom might want to tell a story or two. With proper hosting, rehearsal dinners can be a memorable experience for everyone.